Sahaji has been walking the path of a healer since a young age. After graduating from Silverton High School, Sahaji moved to Kauai, Hawaii and became a Licensed Massage Therapist. For nearly six years she swam in the warm ocean waters and enjoyed the island lifestyle as she grew into her strength as a massage therapist. Knowing that she wanted to assist in the healing process of others in a different way, Sahaji became a Registered Nurse. As an RN, she saw the benefits and downfalls to the western medical model of healthcare. Inspired to create change she enrolled at the Oregon College of Oriental Medicine in Portland, Oregon where she graduated with her Master's Degree in Chinese Medicine and Acupuncture. Sahaji treats the entire family in her practice. She enjoys treating gastrointestinal issues, women's health, and pediatrics but her practice always includes a taste of everything. Sports injuries and musculoskeletal pain are the most common concerns Sahaji addresses in the clinic, but acupuncture can address nearly everything that a human being can experience. In her practice, Sahaji enjoys collaborating with primary care physicians, chiropractors, and naturopaths to bring patients to their optimal health. Sahaji is a skilled therapist who knows the importance of balancing the application of both western and eastern ways of treatment. She brings a deep respect to each individual who arrives in her office and works to create a safe place for healing and self-expression. In her spare time Sahaji spends as much time as possible outdoors with family and friends. She enjoys the practices of yoga, mediation, and mantra and loves exploring what it means to really live. Currently she is studying the art and science of aromatherapy as an adjunct to acupuncture care. Haekyung Dixon Kim LAc. Offering acupuncture, moxa, tuina, and herbal consultations. Hae is a gifted practitioner. She was born and raised in Seoul, South Korea. Growing up in a traditional Korean family she naturally learned how to interact and genuinely care for the health and well being of the community. These traits instilled in her at an early age have allowed her to recognize her ability as a healer. In Korean, Hae, means the Sun. In Chinese, Hae, means the Ocean. Just like her name, she wants to be a healer who shares her natural and healing energy with others and contribute to a happy life. Hae has a Bachelor of Science in Sports Medicine from Kyunghee University, and a Master's Degree in Chinese Medicine and Acupuncture from the Oregon College of Oriental Medicine in Portland, Oregon. She furthered her education after acupuncture school by returning to Korea and going through a clinical internship at the hospital of Kyunghee University in Seoul, South Korea. She is skilled at treating many conditions and enjoys treating women's health, sports injury and recovery, post stroke symptoms, acute/chronic pain, stress and emotional balance, and digestive issues/nutrition. Hae's generous heart is a true gift to her patients and the Silverton community. We feel incredibly grateful to have her at WOW. 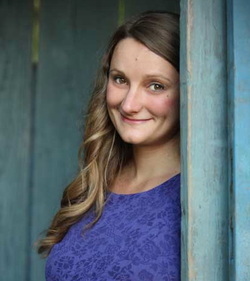 Fedosia graduated from the Oregon College of Oriental Medicine in 2016, focusing on advanced acupuncture techniques for sports injuries, advanced Chinese medical theory, and studying Mandarin. She spent two months post-graduation volunteering in Nepal, providing acupuncture and health care to over 120 patients a week; from work injuries to post-stroke recovery. She also spent time in China continuing her studies of Applied Channel Theory in Acupuncture at Dr. Wang Ju-Ye’s clinic and at the hospital in Beijing. What interests her most about Chinese medicine are the many tools that are used for diagnosis that seamlessly overlap in providing effective treatment at each visit. Her background also offers insights to treating according to folk traditions as well as using Channel Theory and Western physiology to create a definitive individualized treatment plan for all her patients. When she is not in clinic, Fedosia enjoys the outdoors through hiking, climbing, drinking tea and enjoying any food with butter. Beth graduated from Oregon College of Oriental Medicine with her Masters Degree in Acupuncture and Traditional Chinese Medicine. She is a licensed acupuncturist in Oregon, and Board Certified in Acupuncture and Chinese Herbal Medicine with the NCCAOM. Beth has studied Kiiko Matsumoto style of acupuncture with with Monika Kobyleka, LAc, which is a Japanese style of acupuncture in the lineage of Master Nagano. ​Beth became interested in medicine while working in a variety of clinical settings as an administrative professional. While working at Providence Oncology, she developed a passion for learning about cancer and cancer treatments, and had an interest in cancer research. As a longtime acupuncture patient, Beth realized that acupuncture and herbal medicine would help patients withstand their cancer treatments in a healthier way. Thus the decision came to further her education in Chinese Medicine. Beth also has a special interest in treating acute and chronic pain, PTSD, anxiety/depression, insomnia, women’s health, digestive complaints, and many other health concerns with acupuncture, Chinese herbal medicine, and bodywork. Beth enjoys yoga, meditation, qigong, hiking and gardening. She has studied with the Ling Gui International Qigong School with Master Liu He and Dr. Liu Dong, and loves to share Daoist concepts for better health with lifestyle and dietary choices that work with the seasons.